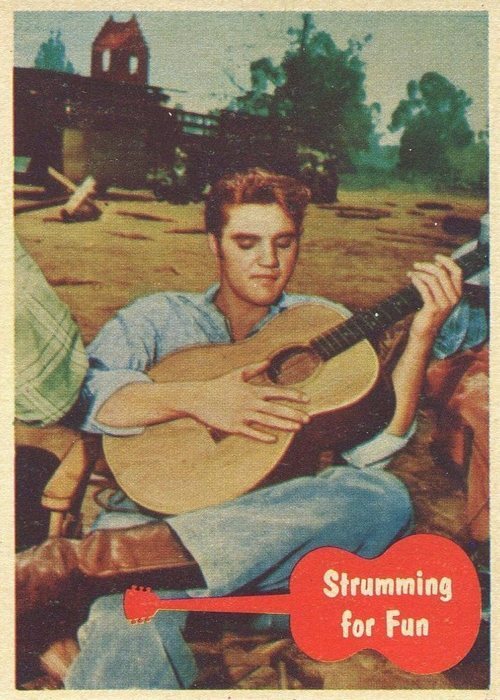 The history of the ’56 Elvis Set might be traced all the way back to 1892 when Morris and Rebecca Chigorinsky emigrated from Russia to the USA, founded the American Leaf Tobacco Company, they subsequently changed their last name to Shorin and had five sons, one of whom died in 1918. 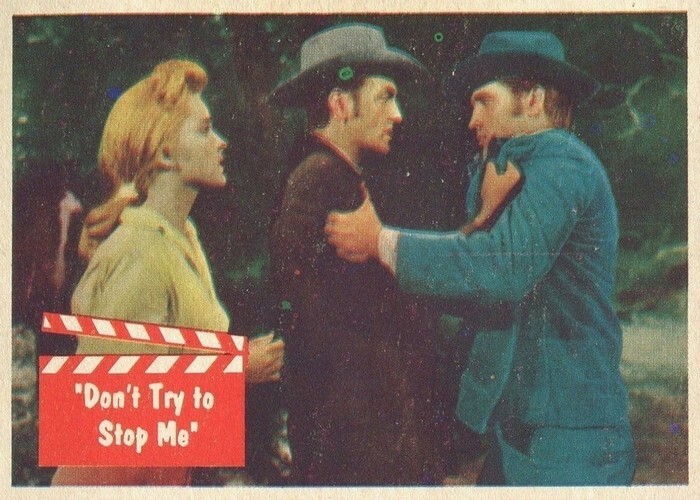 The surviving four boys started The Topps Gum Company in 1938 and during and just after World War II were primarily involved in producing chewing gum products. 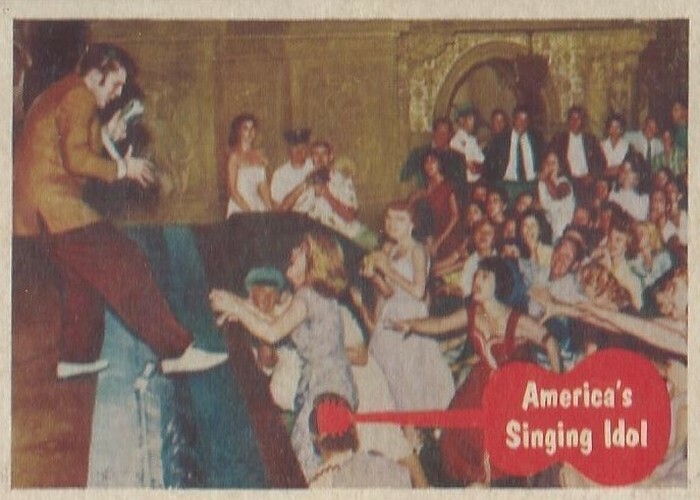 1947 was a turning point for Topps as they (a) launched a new subsidiary, Bubbles, Inc., (b) scored a huge public relations coup when they dumped 60 million wrappers as confetti at the Labor Day parade in New York City to promote their latest product, Bazooka Gum and lastly (c) when Morris’ grandson Phillip hired Sy Berger, his college fraternity brother to work at Topps. Sy is considered to be the father of modern baseball cards. 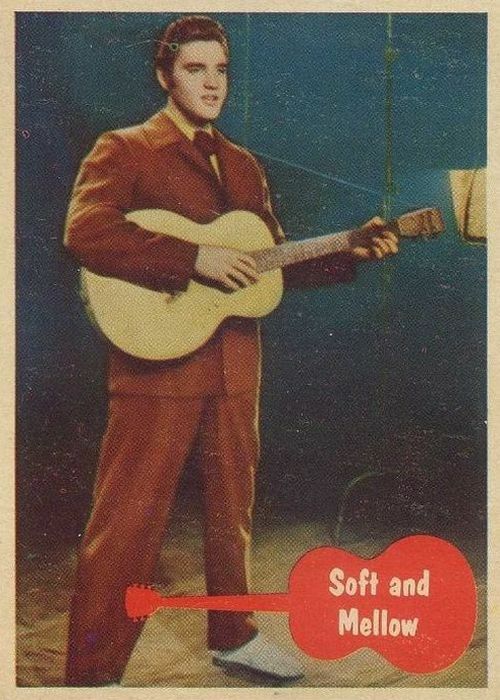 Topps was primarily producing baseball cards in packs to accompany their gum and in the late 40’s also started issuing non-sport material. 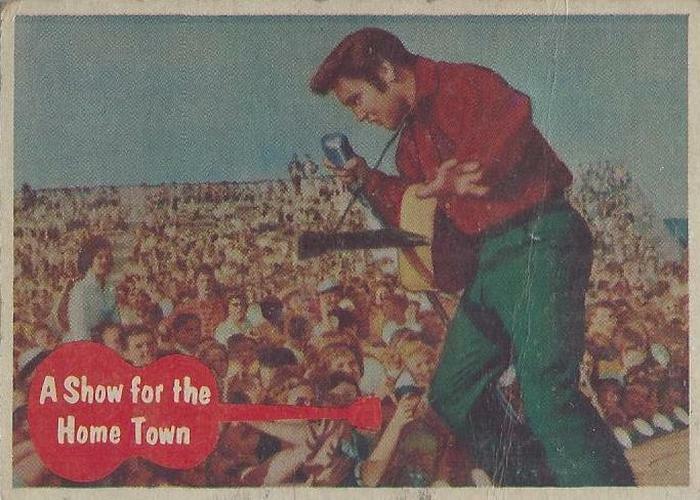 These included cartoon strips, tattoo like products on thin paper and other paper promotionals. 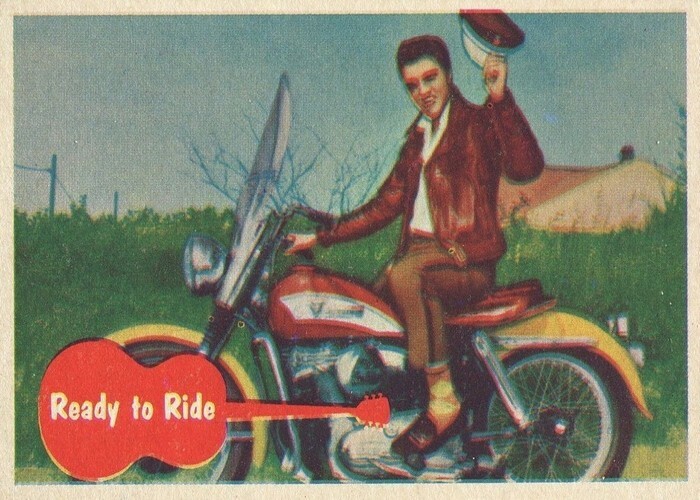 Their earliest true non sport cards began to be issued around 1949 with their Flags of all Nations series followed in the early 50’s by other well known Topps sets such as Look ‘N See, Freedom’s War, Wings, Scoops, Bring ’em Back Alive and Rails and Sails. 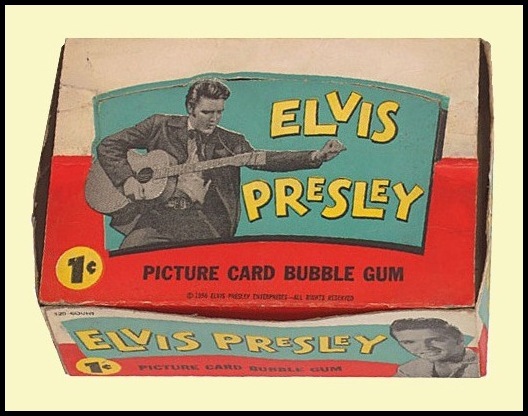 In 1956, Topps purchased Bowman, their biggest competitor, and thus became the preeminent gum/card company in the States. 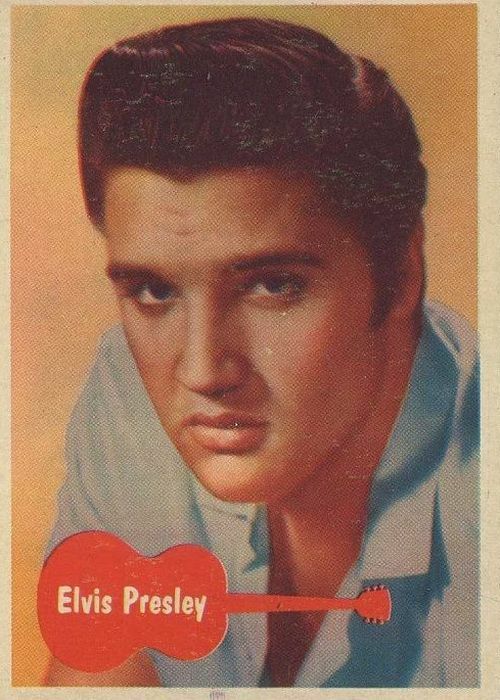 And in the late fall of 1956, following an agreement with the new Elvis Presley Enterprises entity (EPE), Topps produced their famous Elvis set. 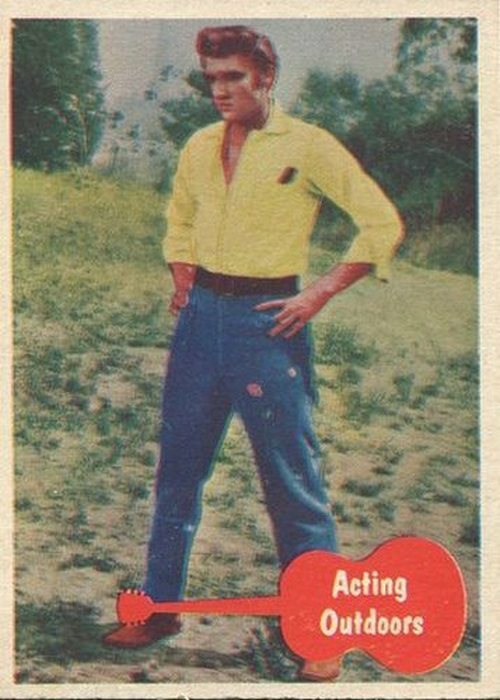 The set came out as being manufactured by Bubbles, Inc. an entity Topps created (apparently out of thin air!) to distinguish the set from other Topps non sport products. 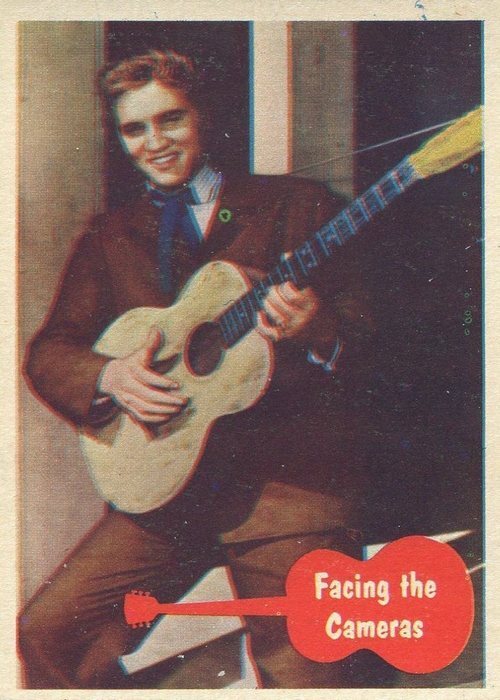 Their Elvis set was not the first Topps set to focus on a single person. 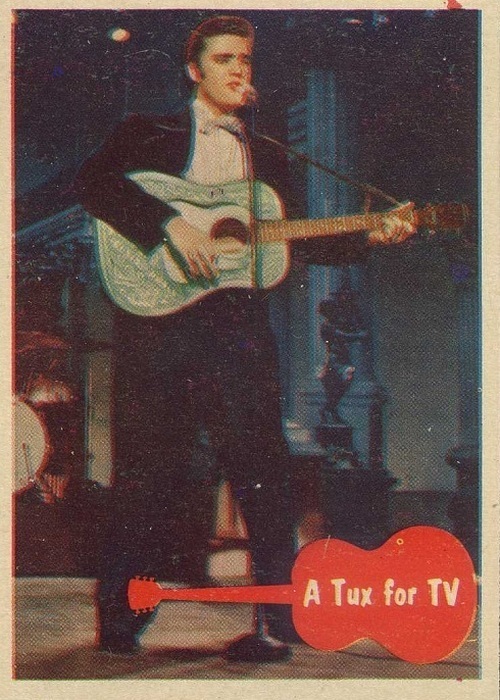 That would have been the Hopalong Cassidy set of 1950 but it was one of the earliest sets to capitalize on the booming rock and roll craze and was the first set to feature a single music artist. 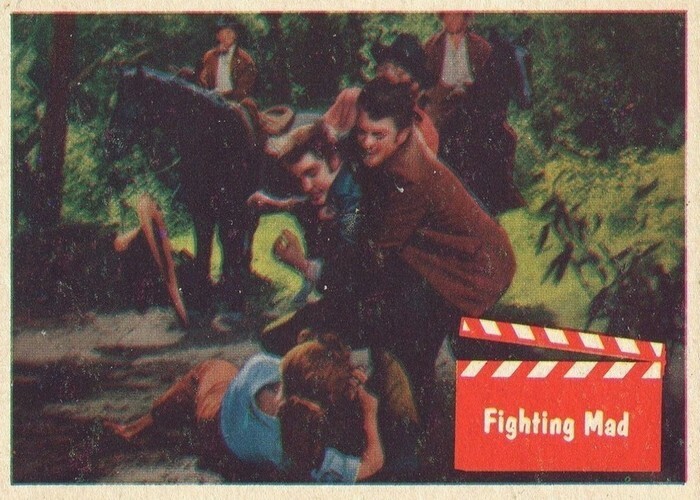 This set is also one of the first non sport sets to utilize the 2 ½” x 3 ½” baseball card size format which became the norm, at least in the States. 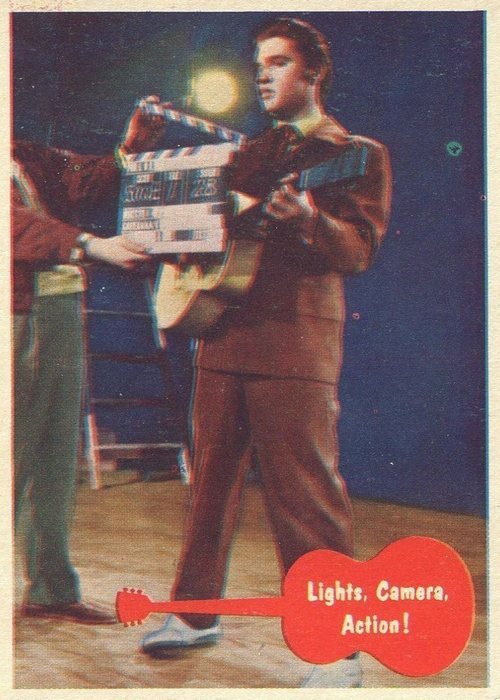 The first 42 cards in the 66 card full color Elvis set feature photographs of Elvis taken on movie lots, in recording studios and at concerts. 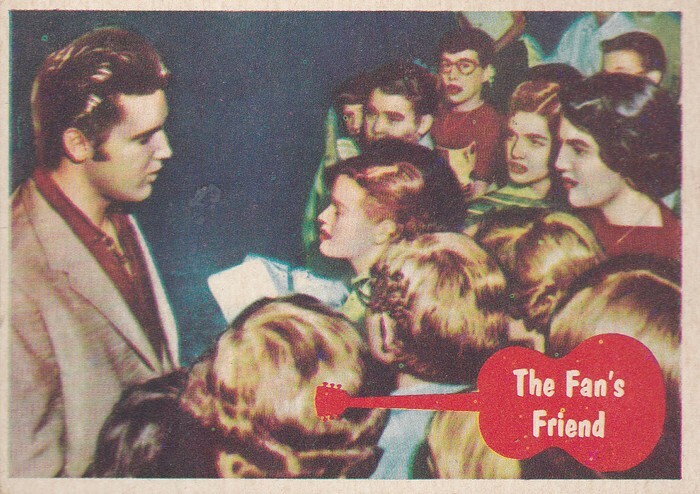 Card captions for these cards are located in a red guitar on the front of the card. 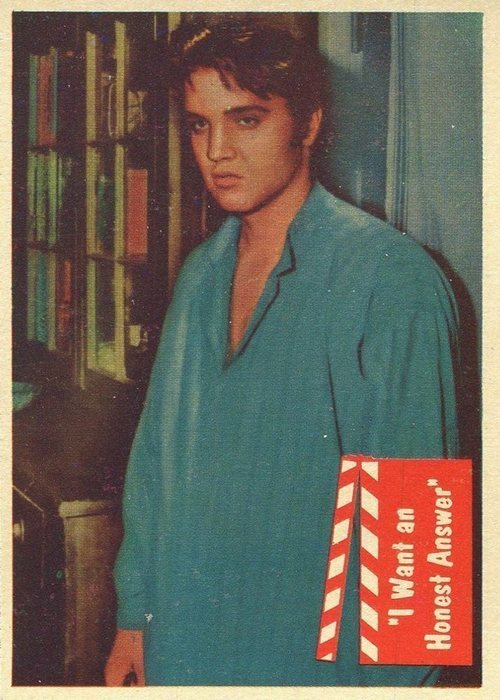 The top banner on the rear of the card posts the card number and an Ask Elvis question which is “answered” by Elvis in the center of the card. 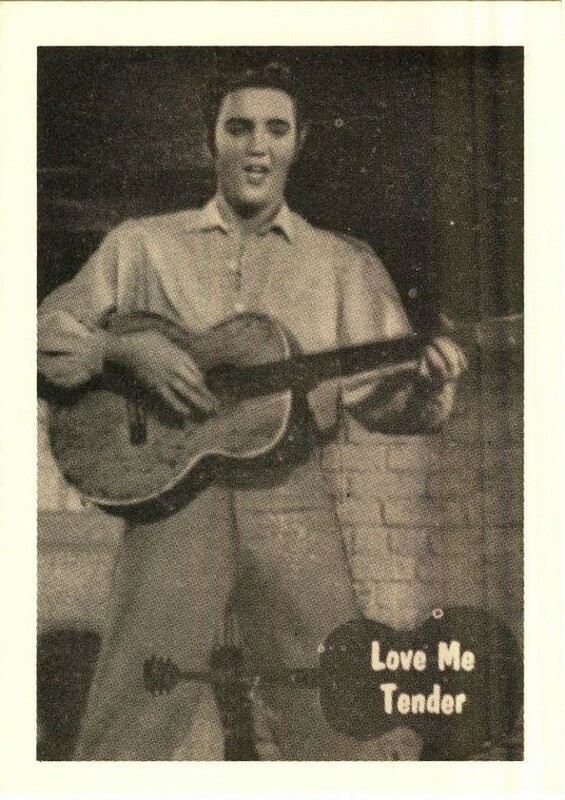 The bottom of the rear side features a facsimile Elvis signature and the EPE and Bubbles, Inc. copyright information. On some cards the notation “PRTD. In U.S.A” appears vertically in the lower right hand corner of the back. 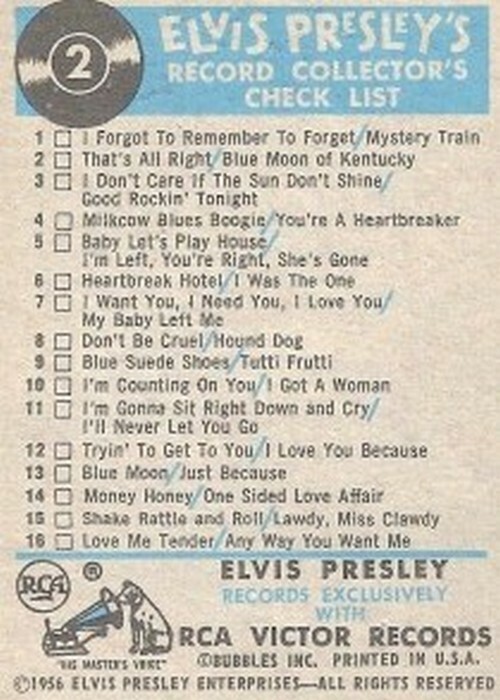 The exception to this is the Record Collector’s Check List card #2 which sets out the A and B sides of 16 Elvis hit 45’s of the day as well as “RCA Victor Records” and the RCA logo at the bottom. The collector was to check off the records he/she owned. 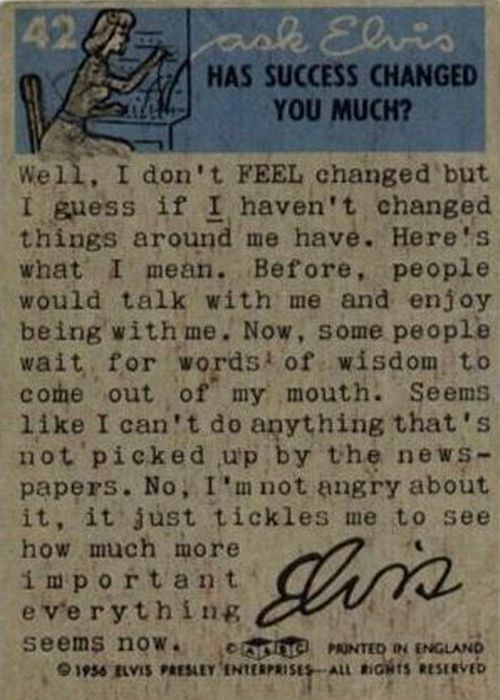 Of course, modern collectors want a clean, unchecked card #2. All cards in the set are notorious for being off center. 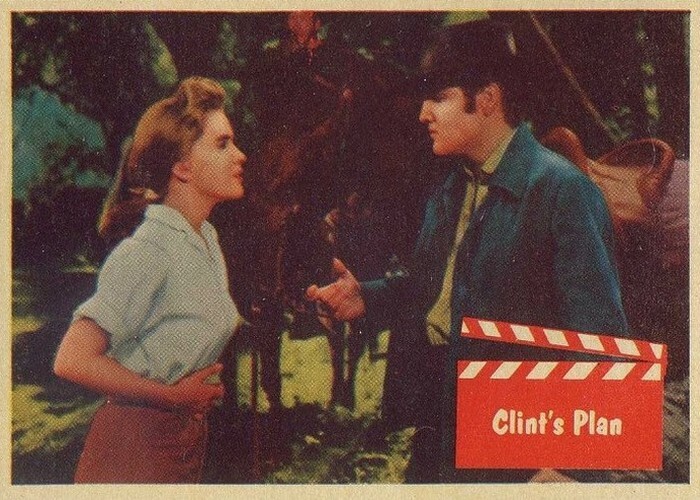 Cards 47 thru 66 reflect scenes from Elvis’ latest film, Love Me Tender, which starred Elvis and Debra Paget. 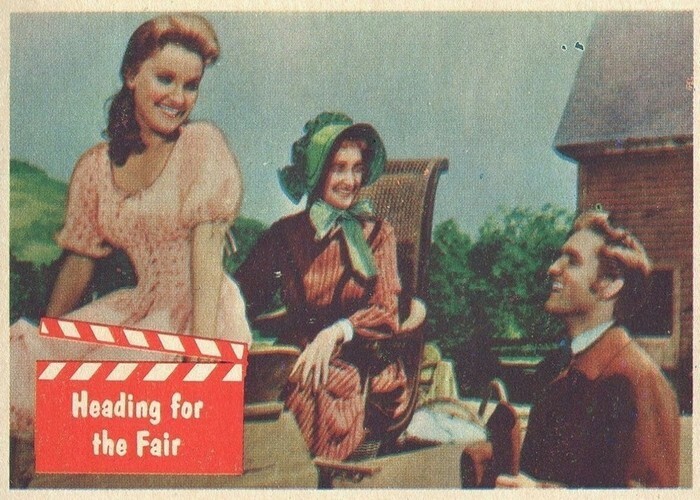 Card captions are located in a red film clapboard on the front of the card. 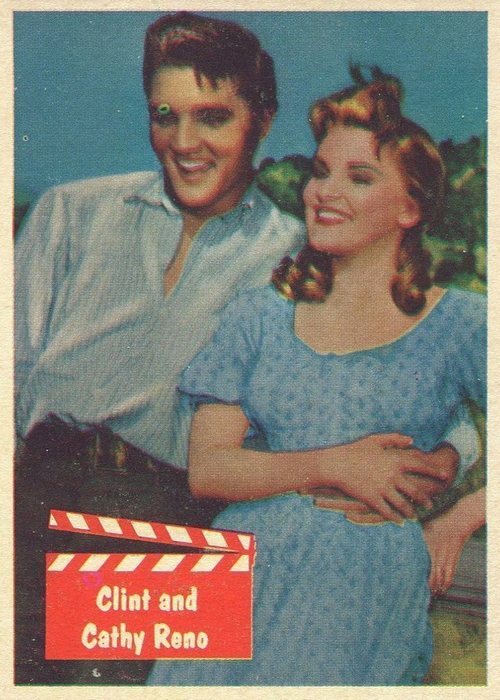 The rear of the card has the card title repeated on the top banner and the complete Love Me Tender story set out on the card backs. 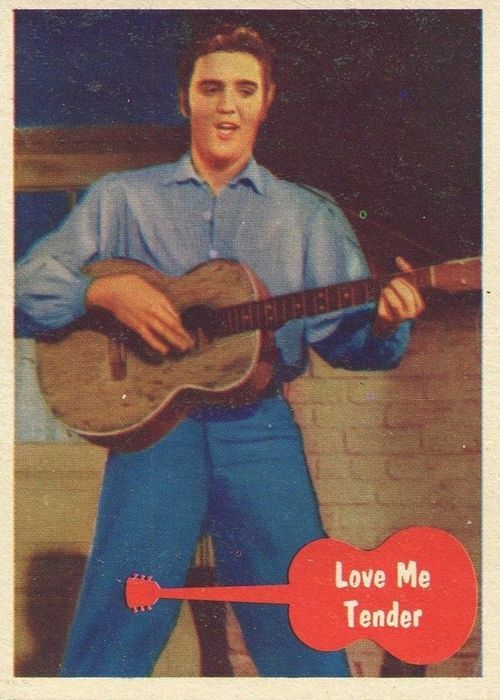 The bottom of the cards include the tag that Love Me Tender is a Twentieth Century-Fox picture along with the EPE and Bubbles, Inc. copyright information. 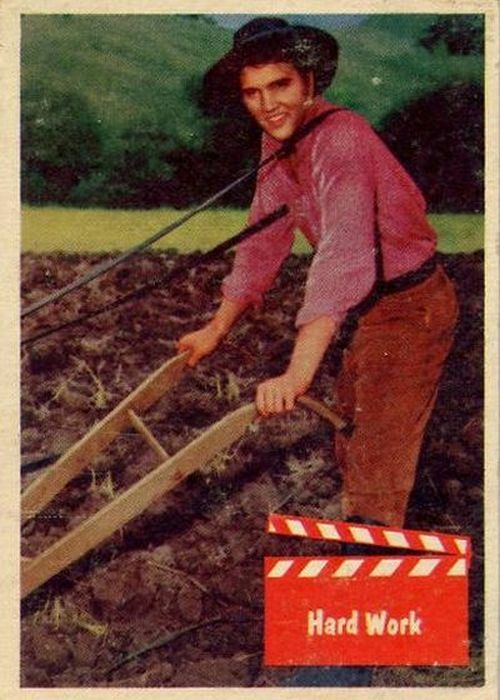 While the word “Topps” does not appear anywhere on the card, it is believed that “Topps” replaced “Bubbles” on some of the Canadian issued cards, at least according to Chris Benjamin’s Price Guide to the 1930-1960 Non Sport cards. 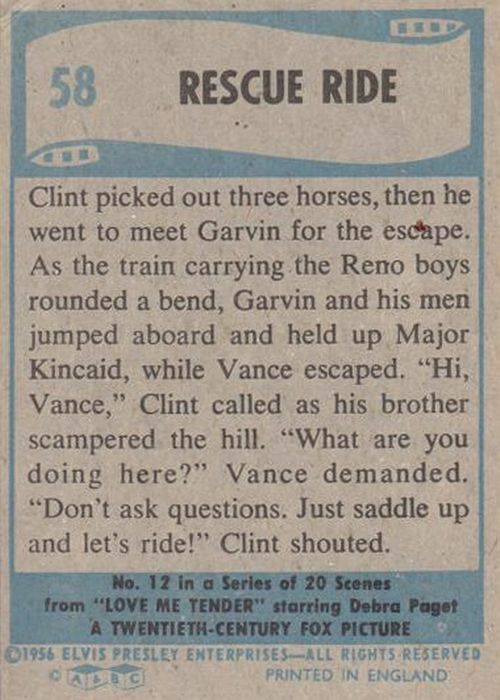 This has not been confirmed and this writer had never seen such a card. 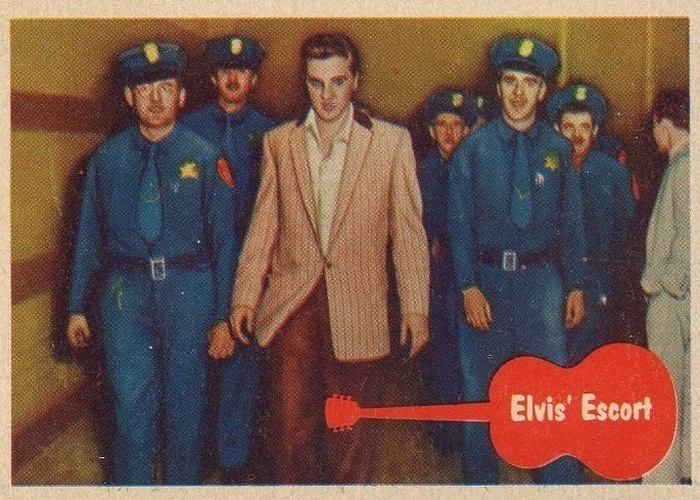 Similarly, no blank back “proof cards” of the U.S. issued set have been seen. 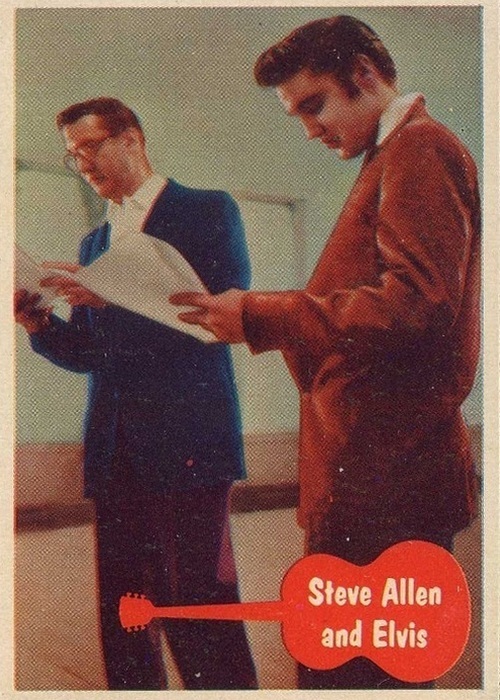 To the left we see a Hobby Card Album, as manufactured by Topps. 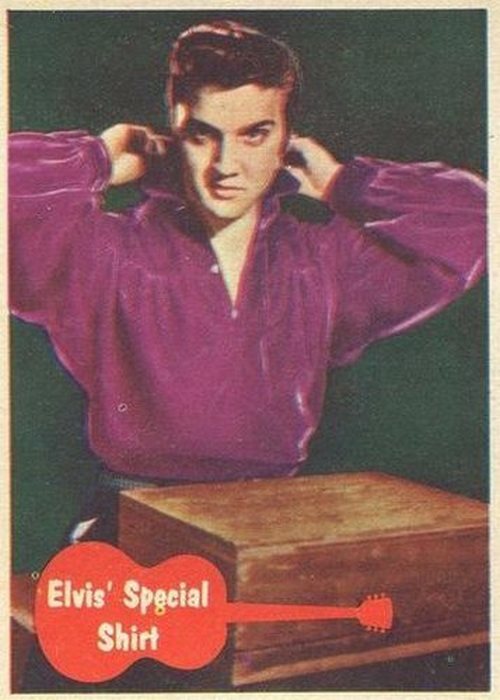 Always looking to promote their product, the Elvis set is believed to have been issued in three ways. 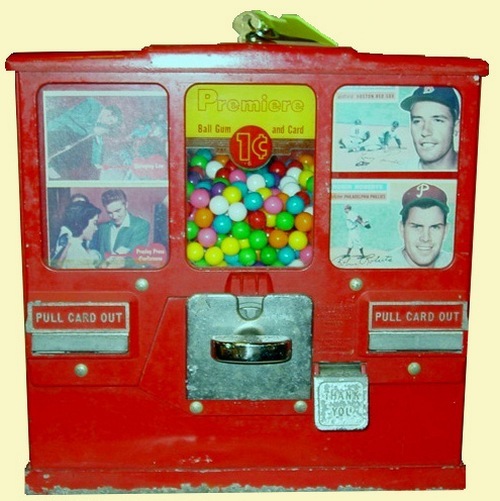 In 1¢ and 5¢ gum packs, in Hobby Card display boxes and in gumball machines. 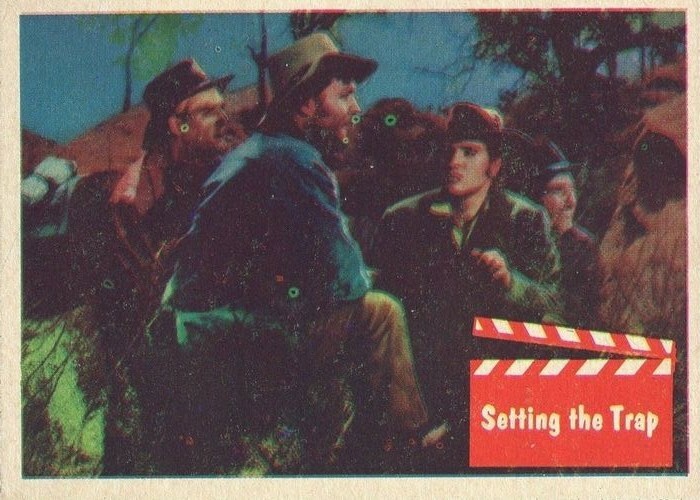 Topps also created a three panel “Salesman’s Sample” piece for their salespeople to distribute to promote the sale of the set. 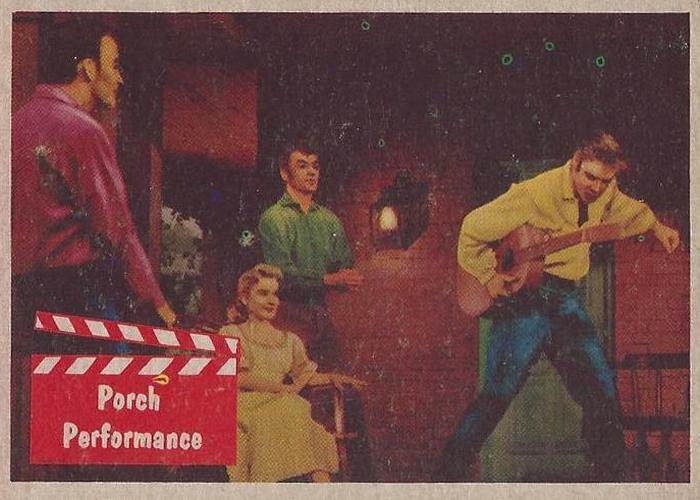 Many of these samples have been cut into three cards and an uncut version of this promo piece is quite rare. 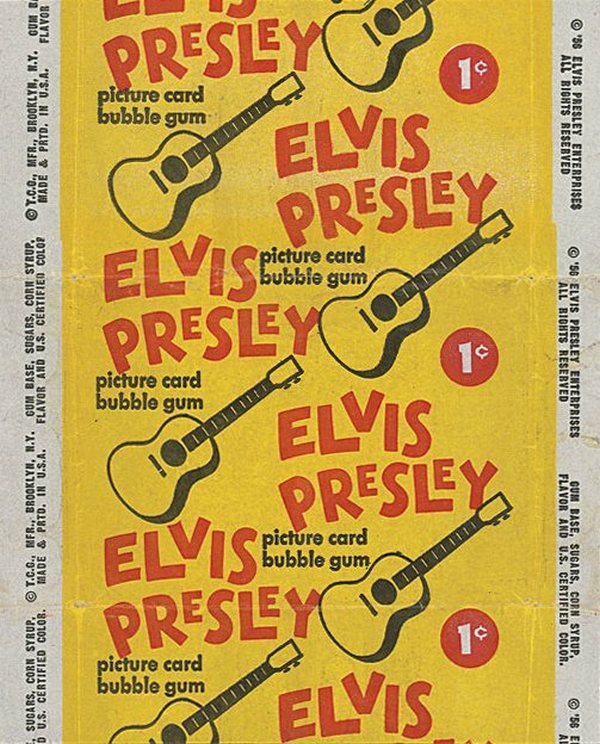 The wrapper for the 1¢ pack is of a ‘continuous run’ 6″ x 4 ½” design. 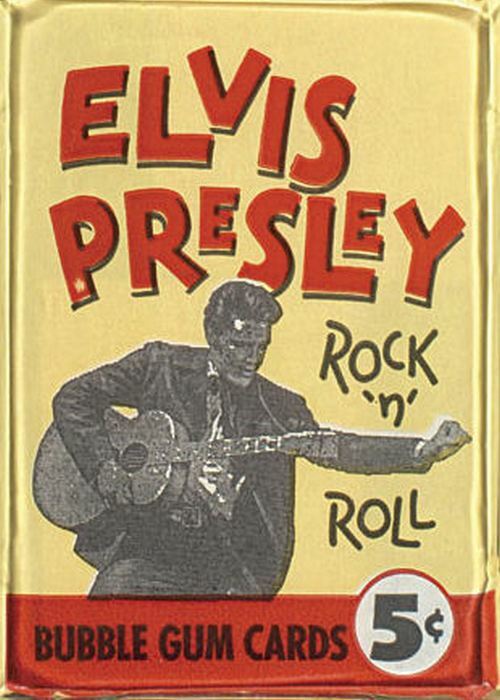 The wrapper for the 5¢ pack is a non-continuous run, stand alone piece featuring an image of Elvis and is 6″ x 5 1/2″. Both wrappers are red, yellow and black. 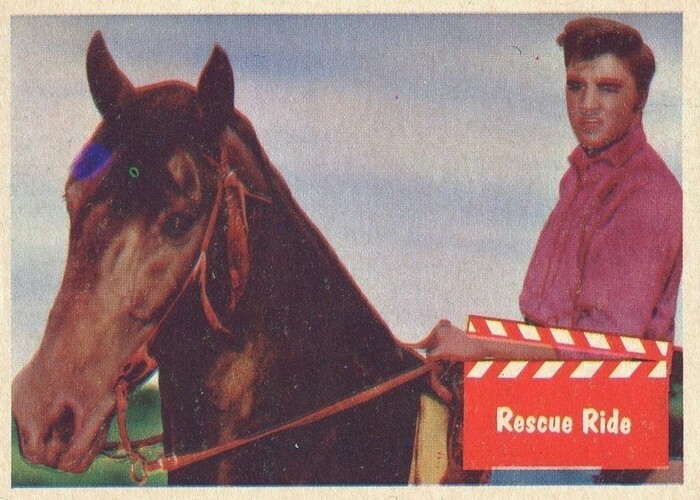 Packs exist for both the 1¢ and 5¢ issues. Display boxes exist for both the 1¢ (see top of this page) and 5¢ packs (to the left), although for reasons unknown, the 1¢ box is scarcer. Canadian issues of the 5¢ box generally have a “36 Count” imprint at the upper right hand corner of the box lid, noting 36 packs to the box. 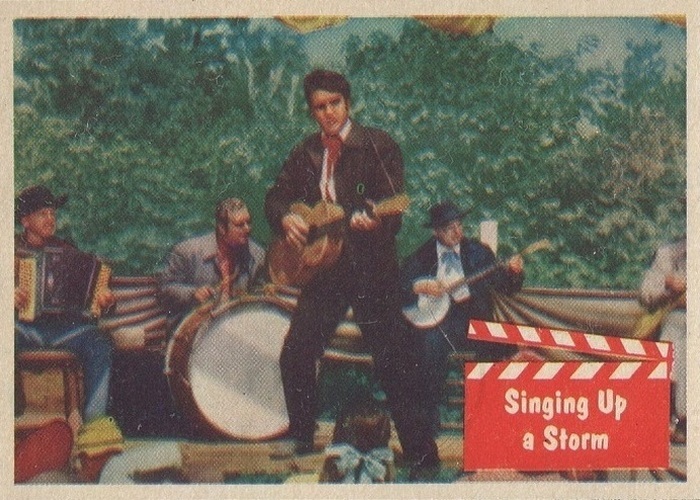 The display boxes for the US 5¢ packs contained 24 packs and the “24 Count” imprint exists on many of the boxes. Full display boxes have been discovered. The sides of the packing carton for 1¢ display boxes notes that there are 24 display boxes to the carton. 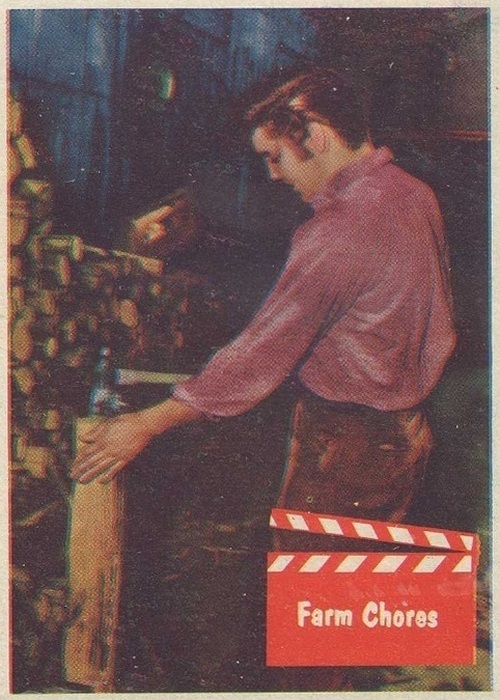 Packing cartons for the 5¢ display boxes might also have been made for shipment of this product but this is unconfirmed. 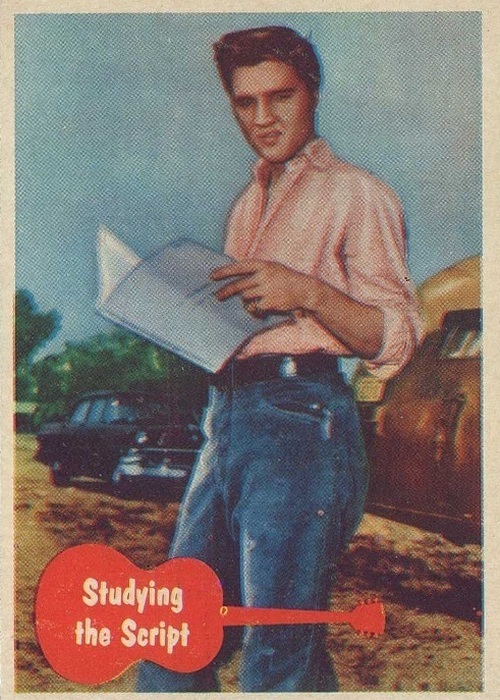 Topps also created an entity called the Trading Card Guild (TCG) as a way to further promote their cards. 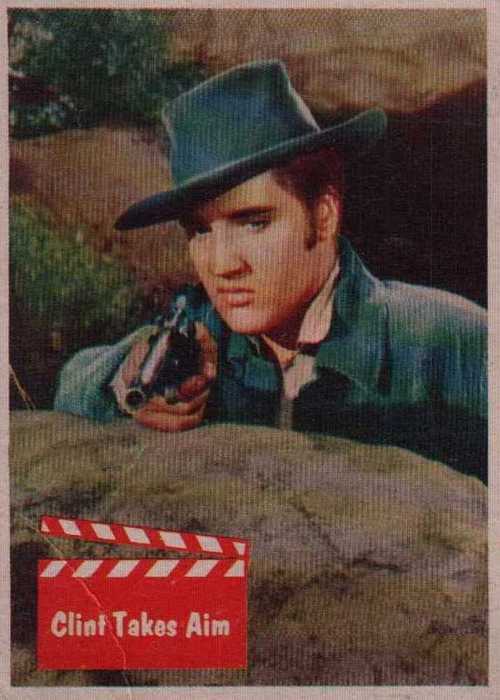 Loose Elvis cards were also issued under the TCG moniker using Hobby Card boxes. There were many duplicate cards in these boxes and it is said that it would have been extremely difficult to assemble a full set out of product from Hobby Card boxes … no doubt another way for Topps to boost sales to the kids. 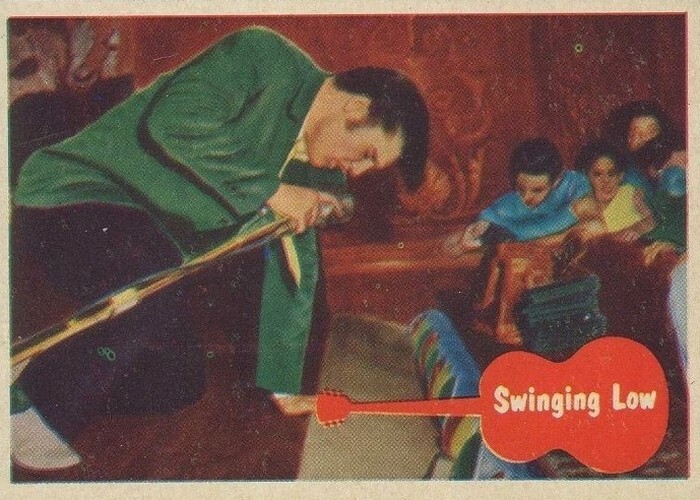 Cards from the set were also believed to have been issued in gumball machines as Elvis cards from the set are visible in images of at least one machine of 1956 vintage. 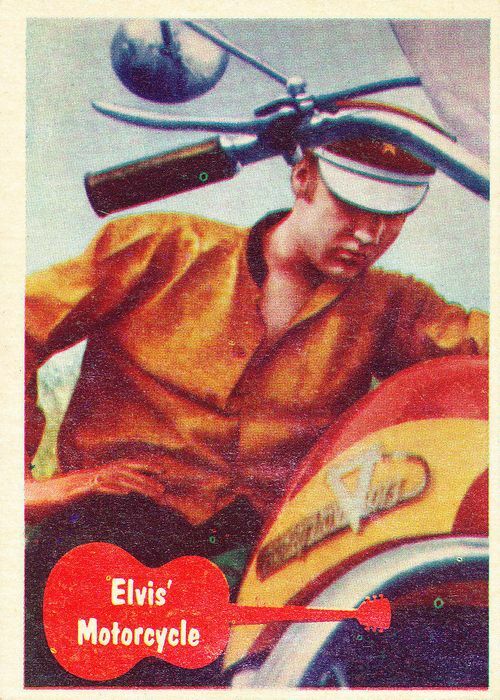 Other machines also dispensed 3 1/2” x 2 1/2” cards and might very well have dispensed Elvis cards … probably 1¢ for a gumball and a card. 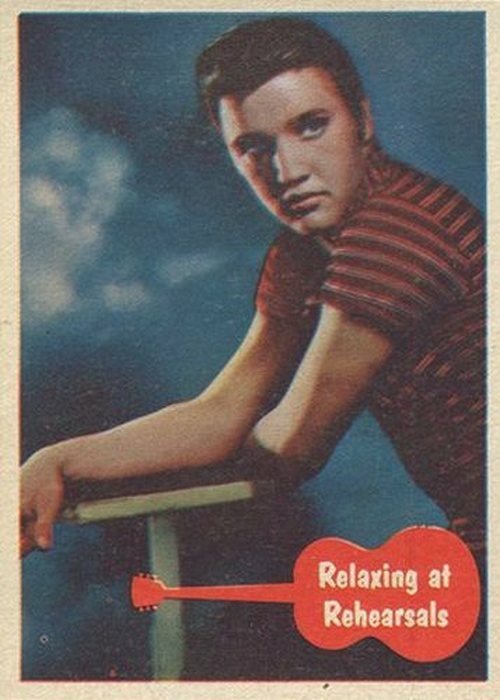 Noting the hot demand for Elvis cards, in the late 50’s, Topps licensed the A&BC card company of the UK to re-release the Elvis set. 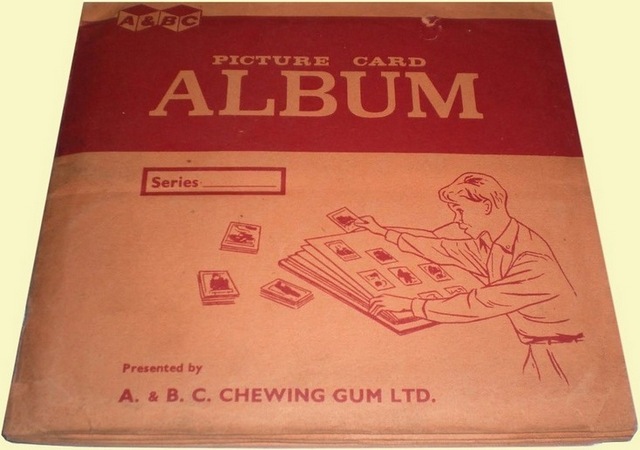 At the time, A&BC was one of the leading card companies in the UK. A&BC’s cards were almost exclusively released in gumball machines as the wrapper/pack method of distribution was far more expensive. As such, no wrappers, packs or display boxes have been seen for this UK issued set nor are they likely to be. 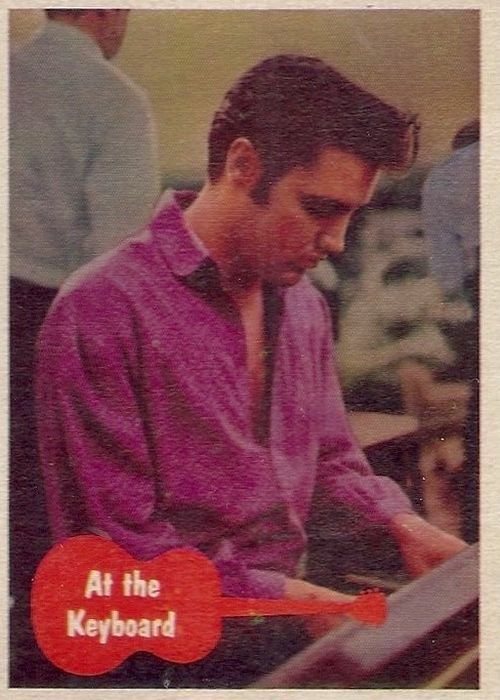 This writer has never seen an image of a gumball machine which has been verified to have been used to dispense cards from the Elvis set although it’s no doubt out there! 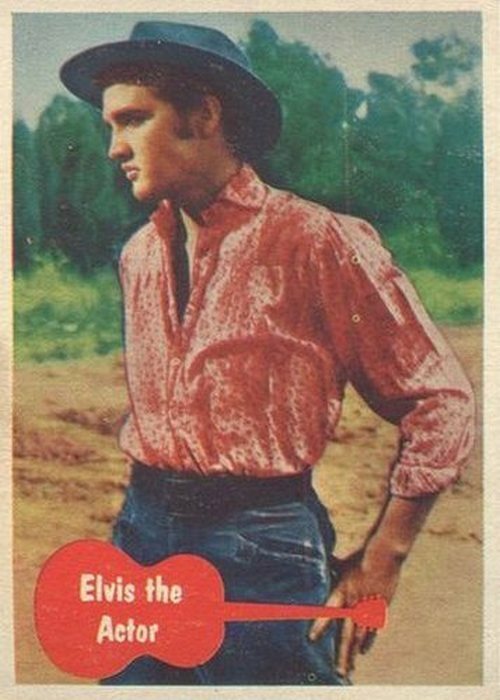 A&BC created a blank grey back proof run of the Elvis cards which set exists but is not believed to have been sold commercially. 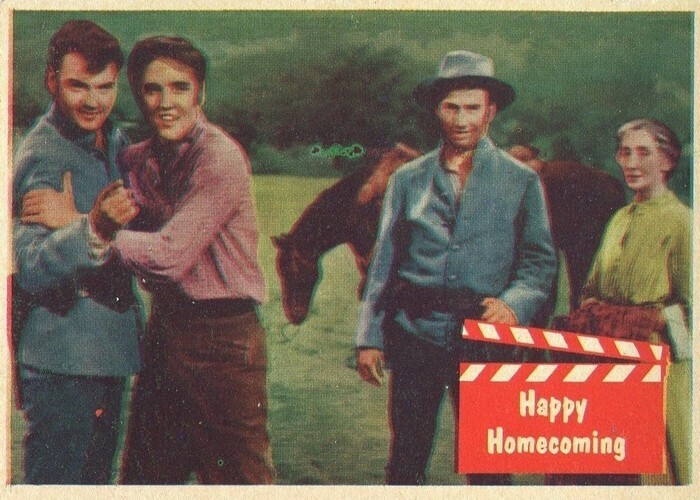 The UK cards are slightly larger than their US counterpart at 3 ¾” x 2 5/8″ and are identical in all other aspects to the US set except for the change in copyright from Bubbles, Inc. to the A&BC logo at the bottom of the flip side along with the Printed In England tag line. 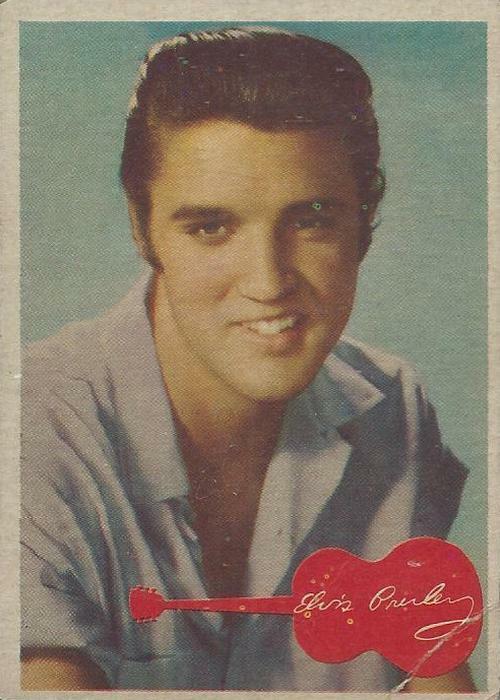 The cards are believed to have been packaged in 1000 card boxes with Elvis cards co-mingled with other cards for insertion by dealers into the gumball machines. 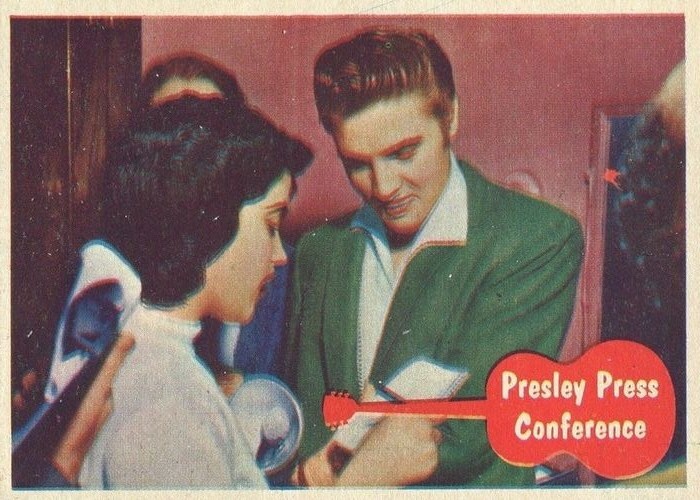 While these boxes have been seen, there is no verification that Elvis cards were inside although given the dates of box use, this is believed to be the case. 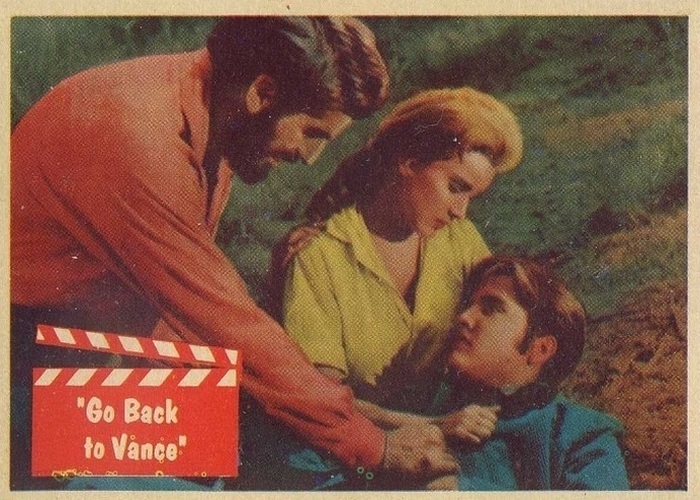 Soon after the release of this set, A&BC adopted the wrapper/pack card distribution methodology. Over the years, there have been a number of efforts to capitalize on this set. In the late 1970’s, for example, a black and white bootleg set was created and sold (by some schemer whos name is fortunately, lost to history). 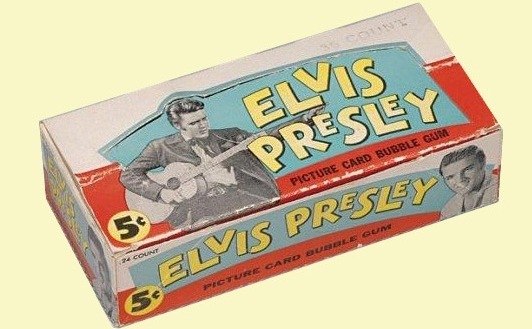 No wrapper or pack is known to have been created for this set which was simply sold as a stack of 66 cards. 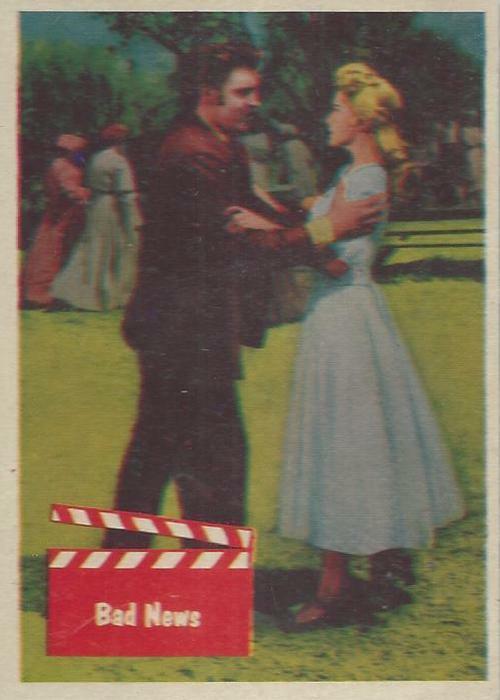 All copyright information has been removed from the back of these cards and the reproduced images are quite crude. 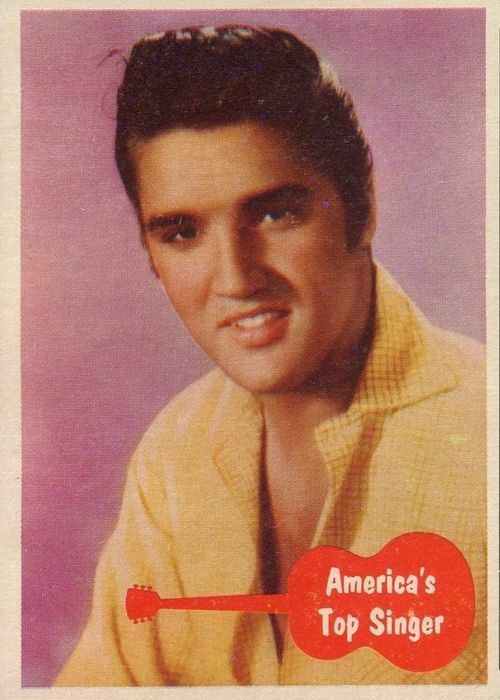 All in all, a great old tribute set for the Elvis fan or the non-sport card collector! Thank you very much for such a well presented and informative topic. Excellent topic! It‘s the “Topp’s”. Fantastic topic, top information, love the back of the # 2 card. Seth, great story and information. 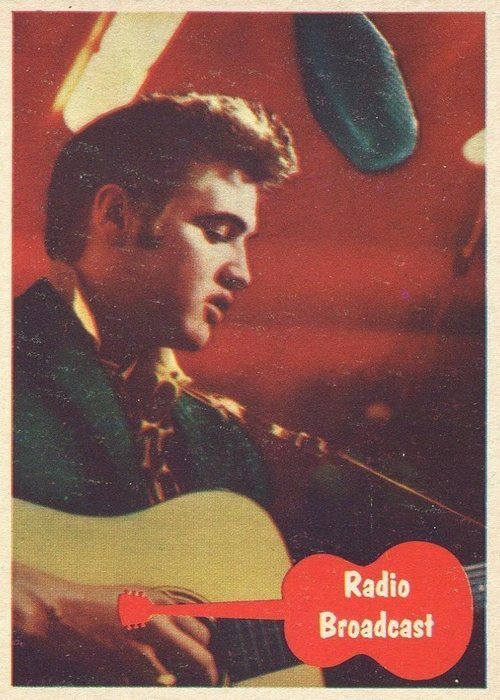 The vending machine picture has the Elvis and 1956 Topps baseball cards, is that real? First one I’ve ever seen! 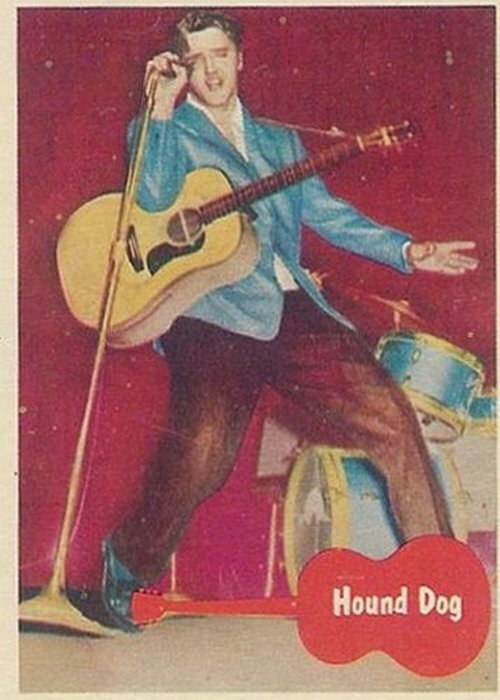 Yes, the vending machine is real and does have ’56 Elvis cards in the display window. 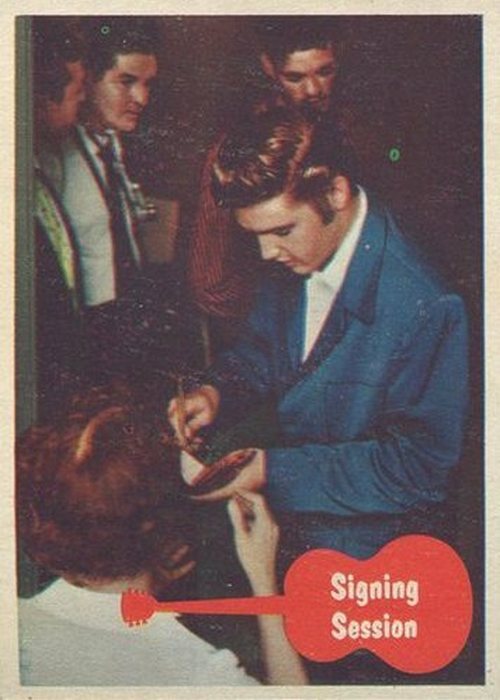 So the assumption is that it dispensed Elvis cards along with ’56 era baseball cards. Hard to tell if the machine was used to dispense US Topps cards or UK A&BC cards but since the machine is of US manufacture and baseball cards are involved, I’d guess….US. I have the equivalent vending machine as portrayed in red and yellow that was manufactured in Antwerp, Belgium by PREMIERE, and named as BRABO.. It has the grey iron stand (with facility to secure with a chain). When I acquired it years back, the unused cards that were still present from it’s last use were PLANES A&BC 1960. Works at 1d (one penny). 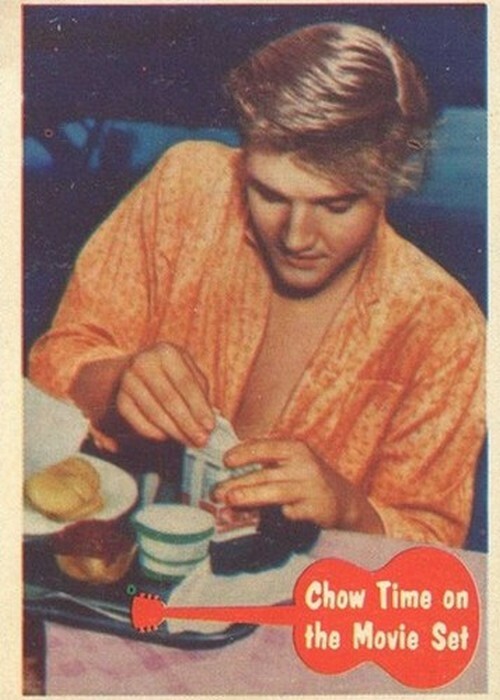 per card/ sweet. = 240 to one pound! 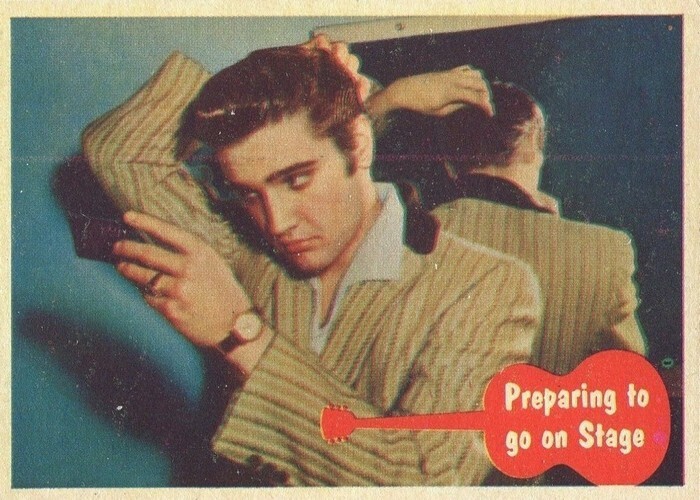 This is very Cool, thank you for all the content and research you do here, I am also an avid Vintage Elvis Collector. 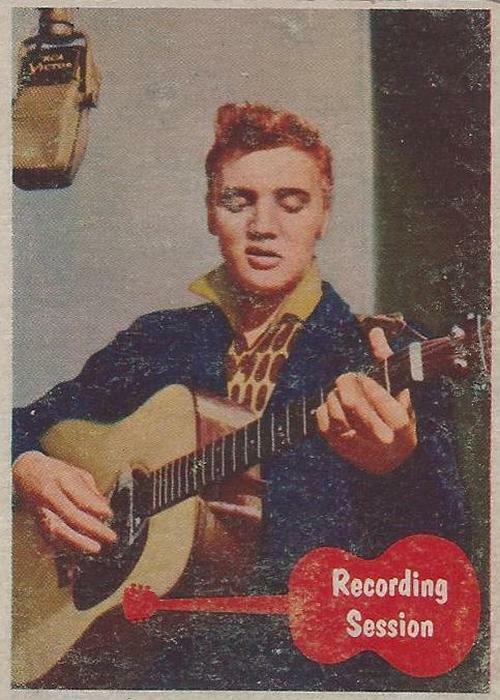 I bought a complete set with the wrappers and boxes included in near mint condition from a private Elvis Collector a few years back, and this set is beautiful. 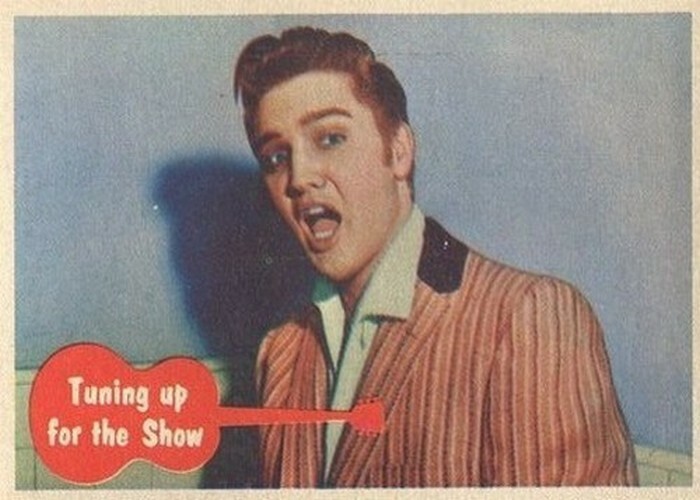 I love being able to hold any Vintage Elvis Record and Memorabila in my hands so I can fully enjoy them. Hi Seth, WONDERFUL these informations about my hobby . You give to us the chance to learn more about these cards . Thank you very much for all . You are a gentleman. NY candy shop ( and whatever else you might still have lying around )? If you feel like it? 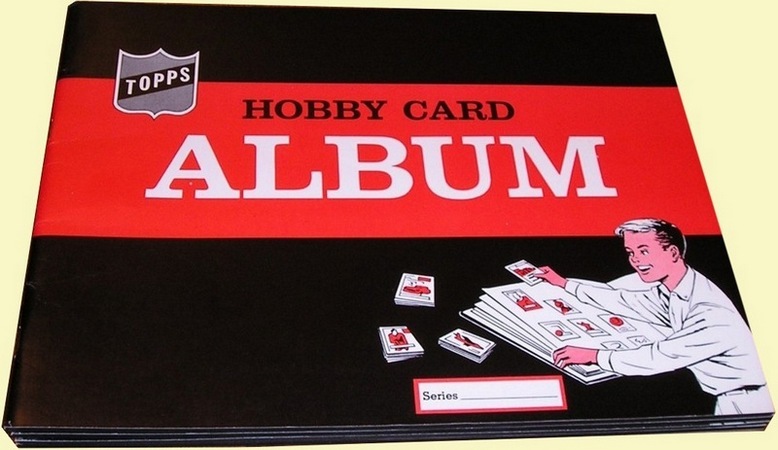 Fab topic – I’ve got the 66 card set but there are so many others to collect like the SAX set and the JENKKI cards ! You have piqued my interest about the value of the three-in-one Elvis promo. Mine is uncut, starts out saying,” Another Topps 3 in 1 promotional. 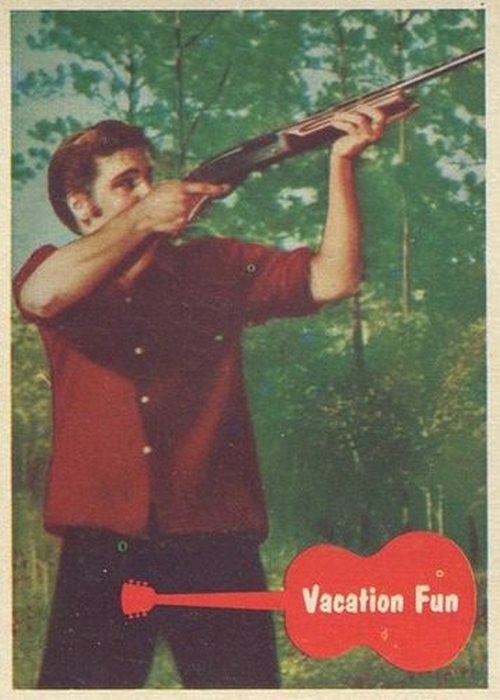 The wording runs the vertical length of the card. The non-CGC grade would be close to EX+. Any guess on a graded, retail price on this card? I picked it up at a show in the very early 80’s along with about three other mid-60’s Topps baseball promo cards that I have long sold. 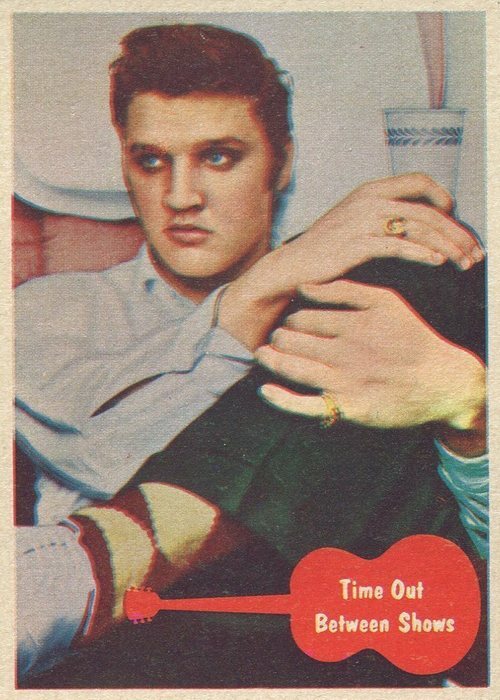 Only the Elvis card survived. Any info and or guesstimate would be much appreciated! 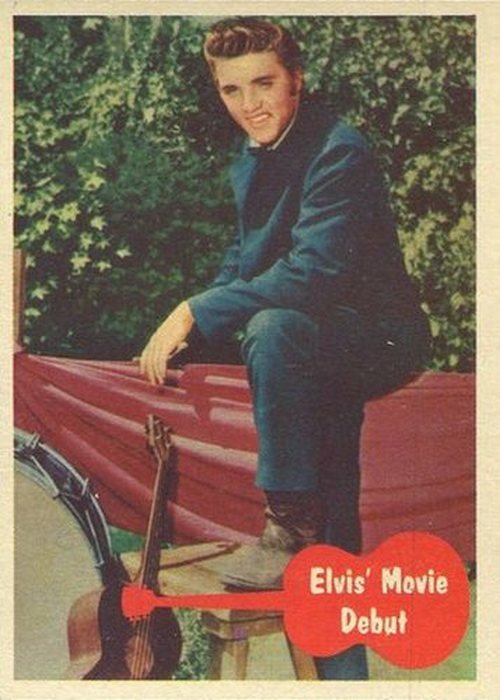 Hard to put a value on your 3 in 1 promotional Elvis card. 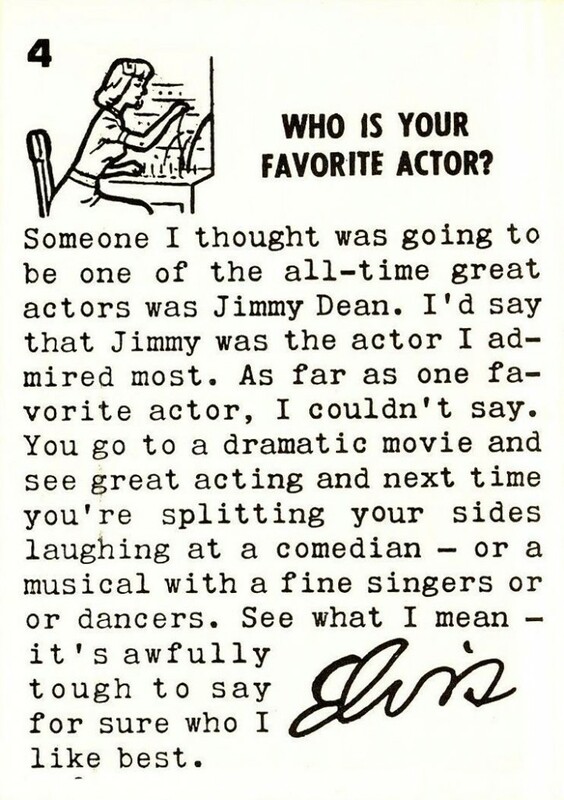 The good news is that the piece is certainly scarce. The bad news is that the market for it is probably thin as only the most die-hard collectors would have great interest. I have seen several uncut pieces and the 3 separate cut cards up for sale but it was awhile ago and I don’t recall the realized price. Best I can do. 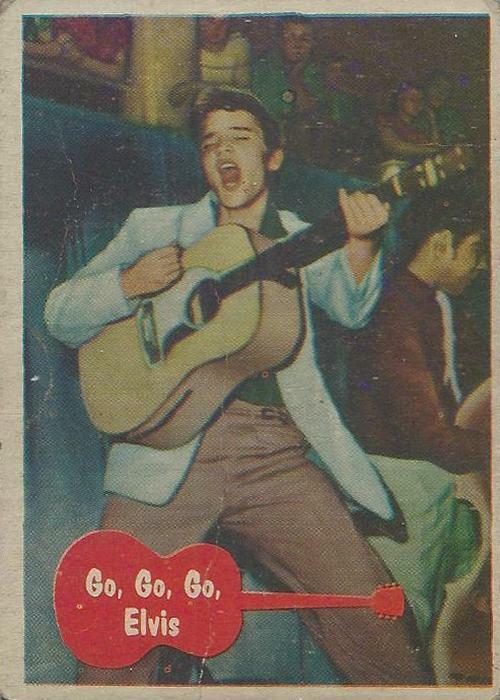 I am a old collector of Elvis Presley trading cards and I never seen a promotional card uncut with 3 pics. Is it possible to see it please the front and the back? Great stuff, I have a mint set and both wrappers, but still cannot find a decent box! As Ger stated, even with beat up ones, the sellers are asking for a lot of moolah. 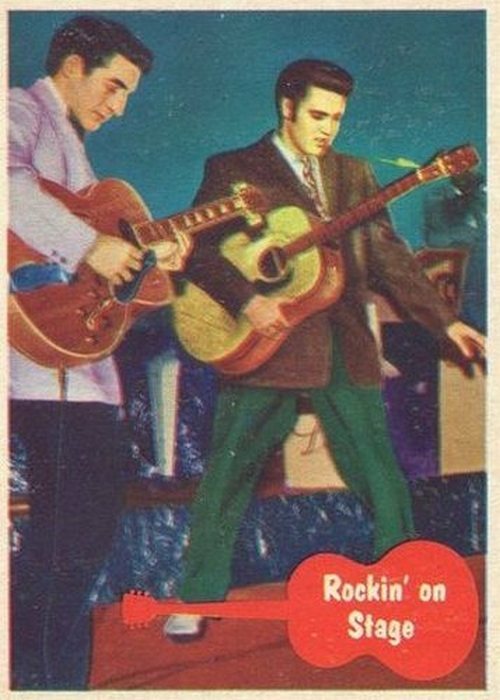 I have an Elvis Topps card, the number 2 in the series, but the back is blank. Were there any like this? 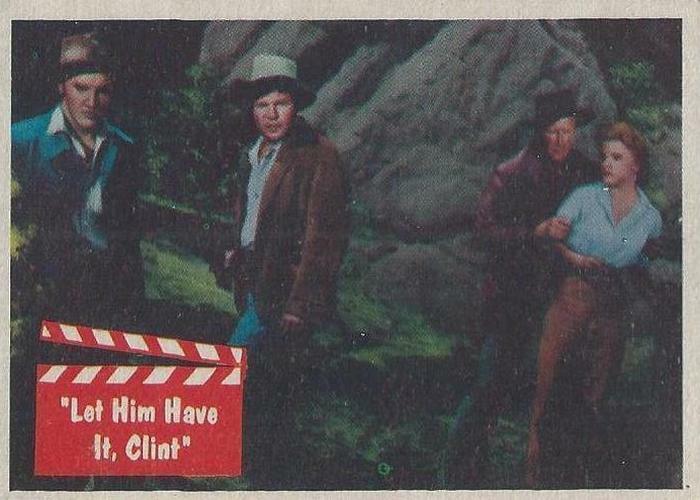 Glen, As much as I respect Ger’s knowledge, I’m not sure he’s correct on this one. If your card is 2 1/2″ x 3 1/2″ then Ger is correct that your blank back card is most likely a misprint. 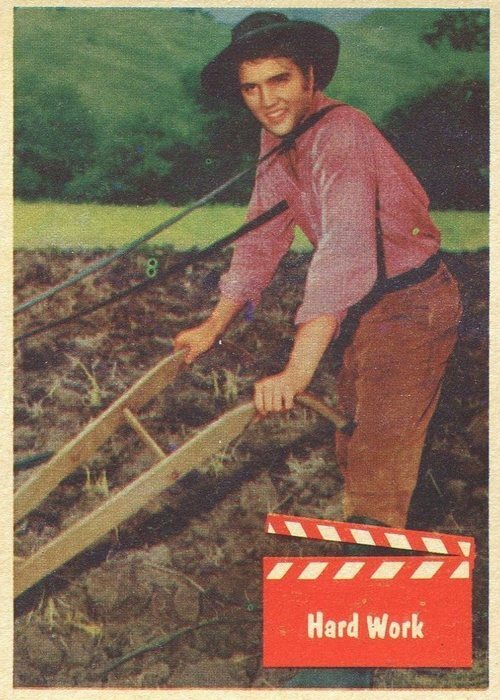 But if the card is slightly larger at 2 5/8″ x 3 3/4″, then it’s a card from the UK version of the set issued by A&BC. Since there’s no way to read the copywrite info on the back….given that the back is blank, the size of the card is the only way to tell if it’s from the US set or the UK set. 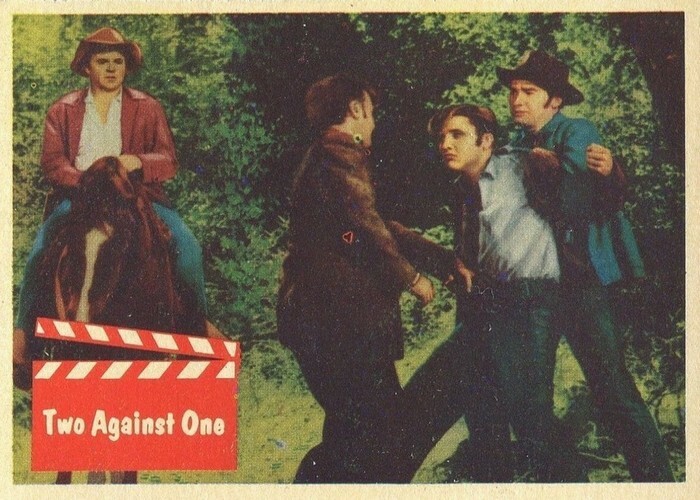 It is believed (and confirmed from a number of reliable sources) that A&BC first issued a blank back proof run of the set before releasing it to the general public with fully printed backs. 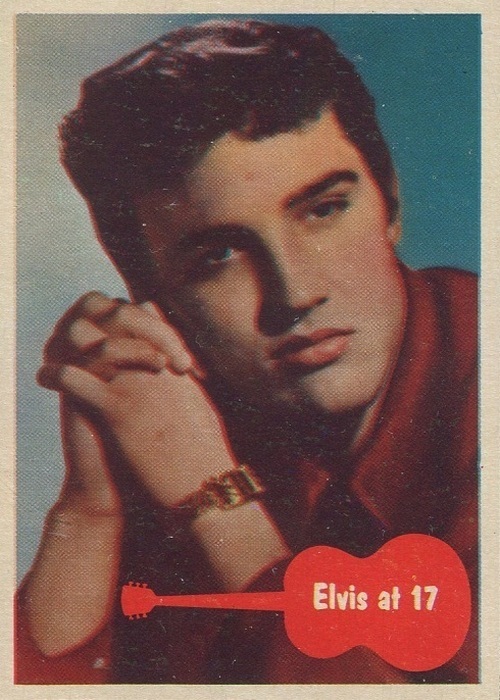 I have a complete 66 card set , with evey card having a blank back. It’s unlikely that all 66 cards are misprints, so while I cannot be 100% certain, I would speculate that the proof run theory is correct. Just read through your stunning article, a labour of love. I’ve just found 7 cards in England with blank backs. Thought you’d be intersted in looking at them. I’ve just listed them on Ebay UK, nathan0003 is my site. 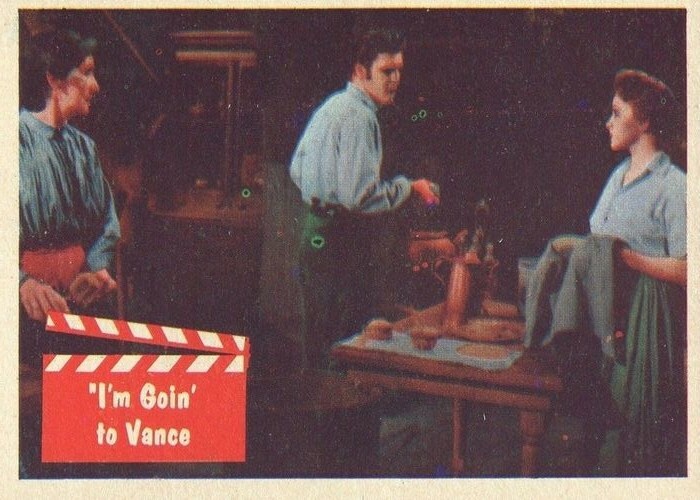 Get back and I’ll forward scans. 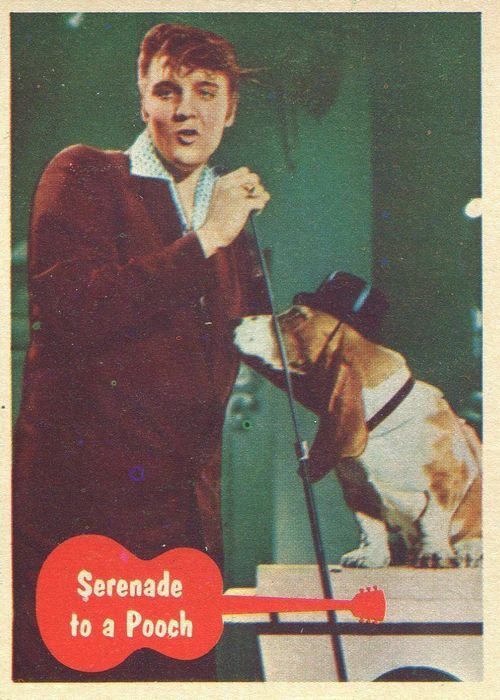 I have an Elvis bubble gum card, the name on it is Hound Dog, No 26. Is there anyone looking for this card? 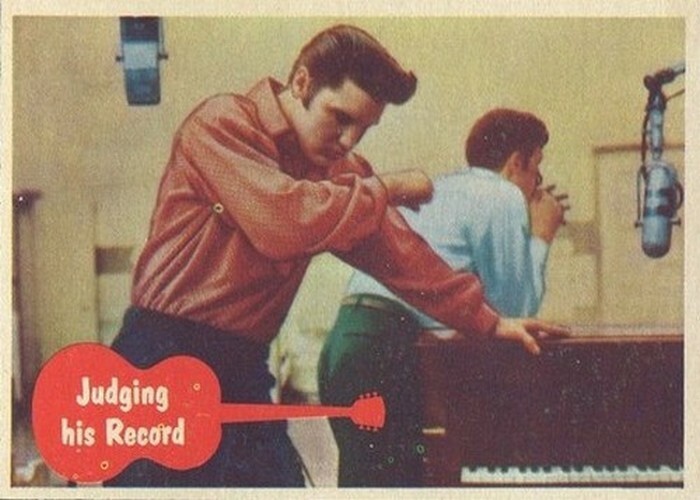 Paying $1000 for the empty Elvis Shipping case. 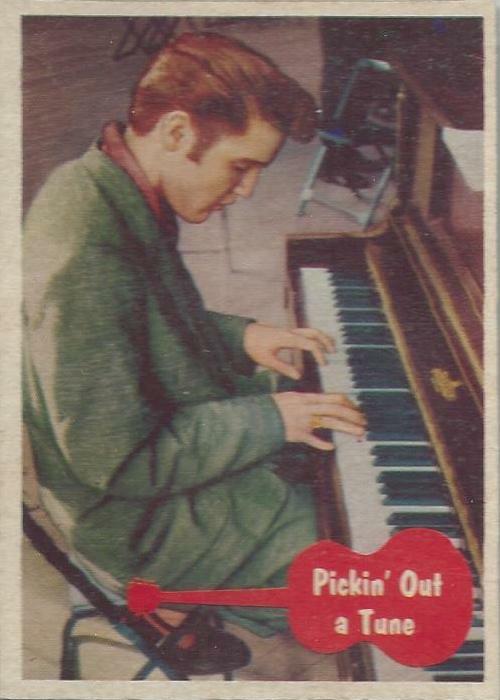 Short of seeing the documentary, “The Pied-Piper of Cleveland” aka “A Day In The Life Of A DJ” my life would be fulfilled if I could buy the complete 1956 Topps/Bubble Elvis Trading Cards. 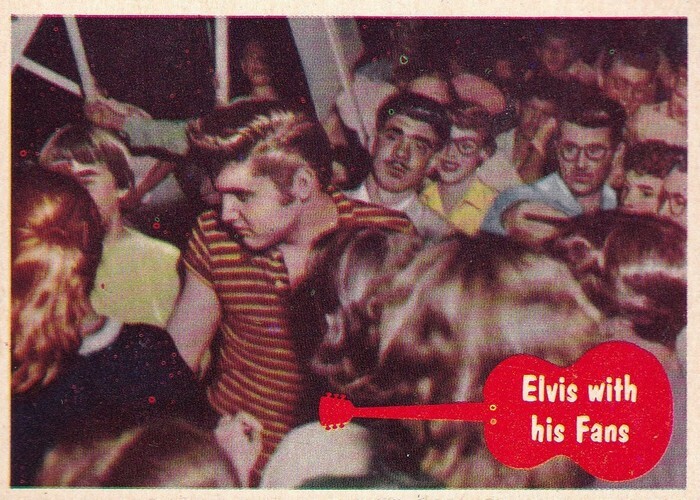 Like thousands of others, I had the whole collection in 1956. 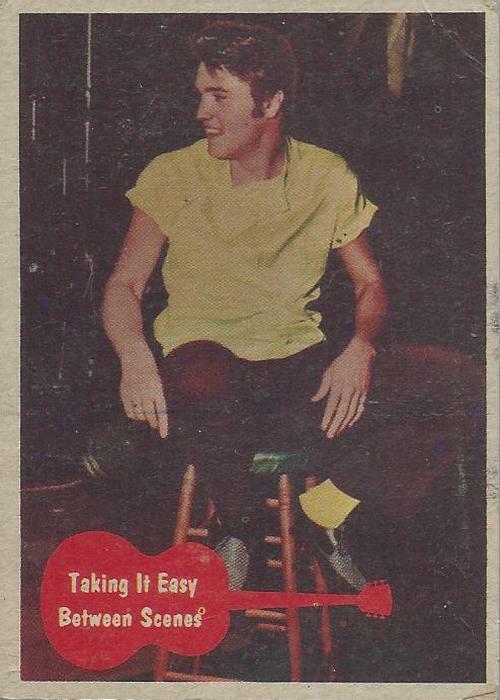 When I went off to college, in 1966, I stored them in a foot-locker in a shed in my backyard. 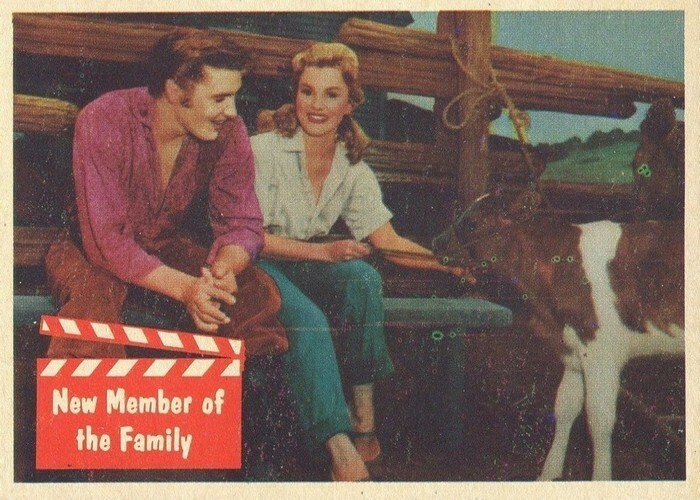 When I returned home after my Sophomore Year, I discovered that my father had thrown them all away, along with complete sets of “Zorro” cards, TV Western, and complete Baseball, Football and Basketball cards from 1956-1965. Such is the price of college education. 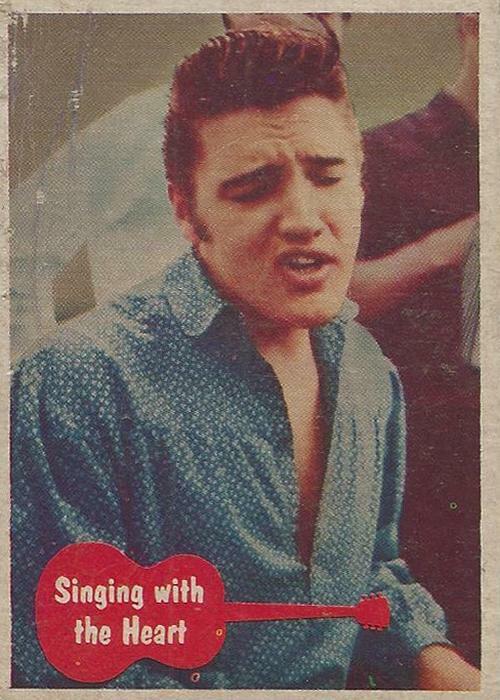 Can anyone help me with the value of the 1956 Elvis gum wrapper one cent variety in just about excellent condition? 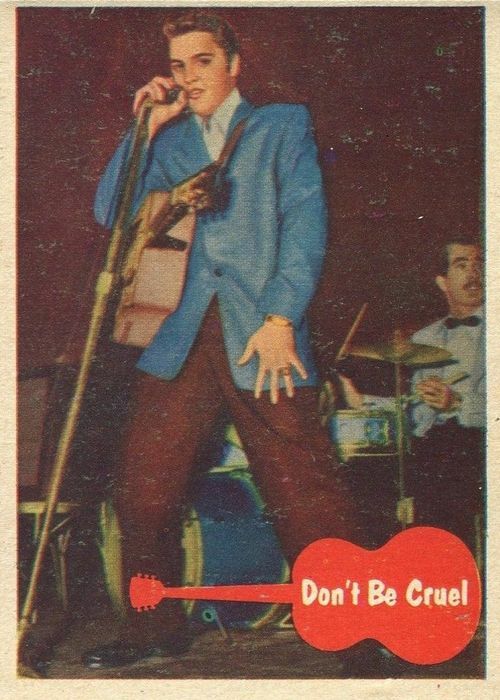 Just my take, but I would think that a one cent 1956 Elvis gum wrapper is probably worth in the range of $100-125 depending on condition. Interesting article. 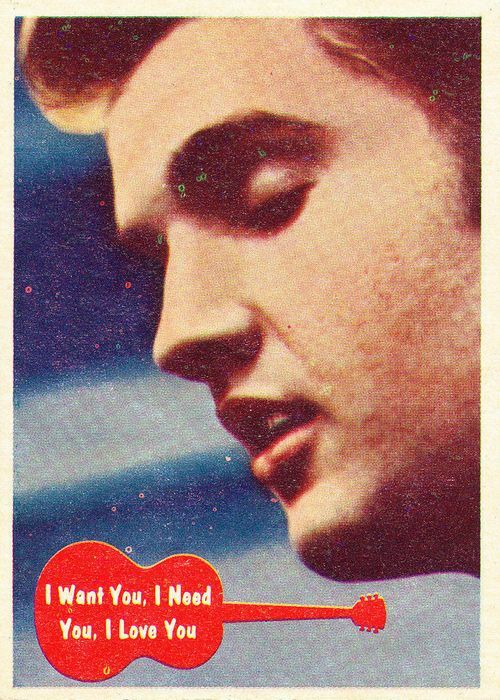 Generally it takes about two to four months to prep the cards before producing them which takes about a month…..that being said….Love me Tender came out in October 1956 , that song made the checklist, so I believe these cards were released in 1957…. PS. just because something is copyrighted with a date, copyrights actually can go for many years and never actually determine the true date of things. it is some other guy with a black beard & long black hair! who is Not even in the movie! 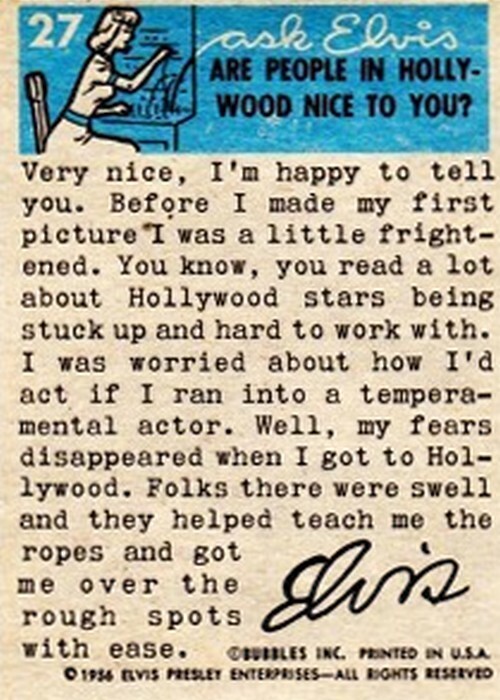 and refused to allow his image to be used in the cards? 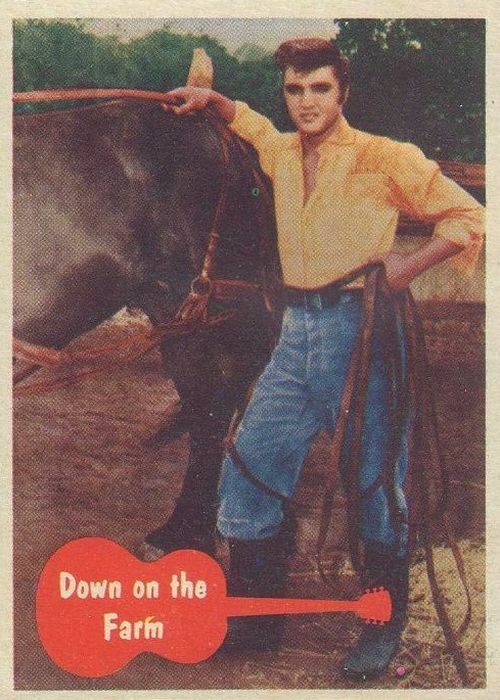 His picture is Not on any of the Love Me Tender cards! I bought an item on ebay several years ago which I think was a branded retail box for the UK A&BC cards (holding around 10 cards). Can’t put my hands on it as present, so not 100% sure, but if I come across it (It’s in the house somewhere! ), I will provide further details. I got # 8 – 13 – 38 – 62 and I would like to sell them. I have the following: No.3; No.4; No.5; No.7; No.11; No.12; No.13; No.14; No.19; No.20; No 21; No.22; No.25; No.26; No.32; No.33; No.35; No.36; No.37; No.38; No.39; No.44; No.45; No.46; No.47; No.48; No.49; No.52; No.54; No.56; No.57; No.58; No.59; No.61; No.63; No.64; No.66. Is there a possibility of selling these to a collector as we are retired and our children do not want to continue saving these going forward? Additionally, I have much, much more items I would be willing to sell, ie concert stubs, tshirts from concert, albums, photos, etc.